The way Kuroto Dan was destroyed was a quite of improvement to what happened to Bilgenia in Kamen Rider Black. 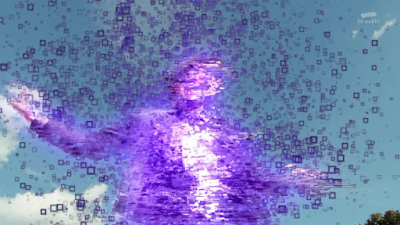 If you remember Kamen Rider Black episode where Shadow Moon awakens and take over it was anti-climatic. I felt Kuroto's death has more plot than Bilgenia's sudden demise at the hands of Shadow Moon. Parad appears to be menacing and he's already has what he needs to complete Kamen Rider Chronicle game. 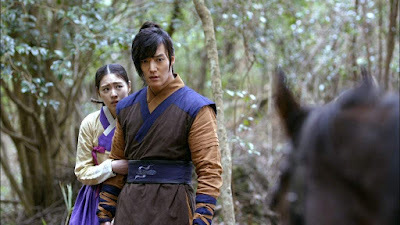 Gu Family Book: Who's The Monster And Who's The Man? I've just finished Gu Family Book. What I could admit is that it's a pretty good story and I can't put it down. True, it's got a lot of crack but again, what do you expect when it's a fantasy-based sageuk or Korean period drama. It's not your typical historical series but it's sort of like Inuyasha but given a Korean twist. Okay, I haven't seen Inuyasha so I'll just focus on Kang Chi's character. Maybe I might make a few Super Sentai references due to similar characters such as Yamimaru from Turboranger or Eiji Takaoka from Boukenger. I do feel pretty mixed when it comes to the end of a good villain. That is unless the writers decide to revive Kuroto to take revenge on Parad if the actor hasn't fully left the set. Kuroto's been trying to create the ultimate game so he could rule over humanity only for his plan to backfire badly at him. So what do do I feel about this one? It's almost like how Bilgenia in Kamen Rider Black was as a villain. A total badass who ends up getting destroyed at the hands of another villain. Do you remember Shadow Moon's awakening in Kamen Rider Black? Shadow Moon awakens after the Gorgom priests feeds him their life force. Shadow Moon's first act as a Century King candidate is to get the Satan Saber from Bilgenia. Bilgenia returns, tries to defeat Shadow Moon and is destroyed. After Kuroto's defeat at the hands of EX-AID's latest form he gets some treacherous "help" from Parad. I'm back to watching some Korean TV series. I had a huge overdose of Super Sentai, Kamen Rider and almost everything Japanese that I feel like a momentary break or taking it slow helps. While I'm still devoting myself to weekly reviews and opinions of Kyuranger in my Super Sentai blog and maybe I'll give some updates on Kamen Rider EX-AID (though I feel like a lot of cliffhangers should give me a break but I want to see more episodes come out) whenever I feel like it so here's my latest watch. I'm watching the story of Kang Chi which is also called Gu Family book. Right now it's just a challenge. Watch Toku or watch Korean shows? I can enjoy but sometimes it's best to focus on one thing at a time. I could talk about one thing I find to be very funny. I never had an interest with K-Pop even if I enjoyed watching some South Korean shows. What led me to have an interest with South Korean shows can be attributed to taste fatigue. I watched Meteor Garden out of curiosity and because I felt like I had watched too many Tokusatsu series at once. Then I went back to watching more Tokusatsu last 2008 because I had watched too many Taiwanese shows at once. There are also times I like the musical score but not the show. So I wanted something new and I said, "Hey it's not all that bad!"